A grieving dad whose son was killed in a suspected hit-and-run accident at the weekend used a newspaper website to reveal his passing. The Lincolnshire Free Press and Spalding Guardian uploaded a story to its website on Saturday saying a cyclist had been killed following the incident last Friday night. At this stage the police had not revealed the victim’s name, but later that day Stephen Osborn went onto the story comments to reveal that it was his 27-year-old son Tim. 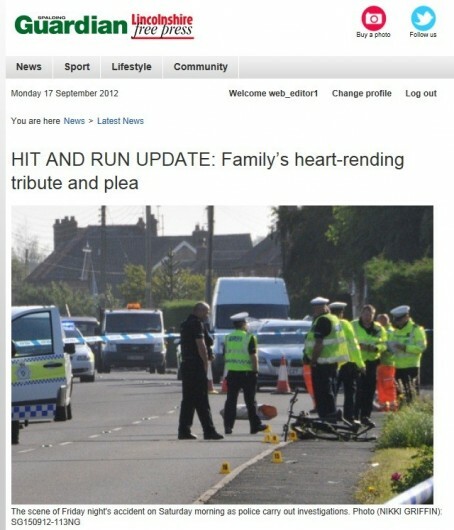 Mr Osborn also used the site to issue an emotional appeal for the driver involved in the incident to come forward. He wrote: “I am sad to say that my son was killed by a hit and run last night on his way home from work. I would like to thank all friends and family who have popped in, messaged or phoned us. Photographer Nikki Griffin was the first Free Press and Guardian staffer on the scene after hearing that a road had been closed due to a serious accident. A neightbour close to the accident scene told her that it was a hit-and-run and that the cyclist had been killed. 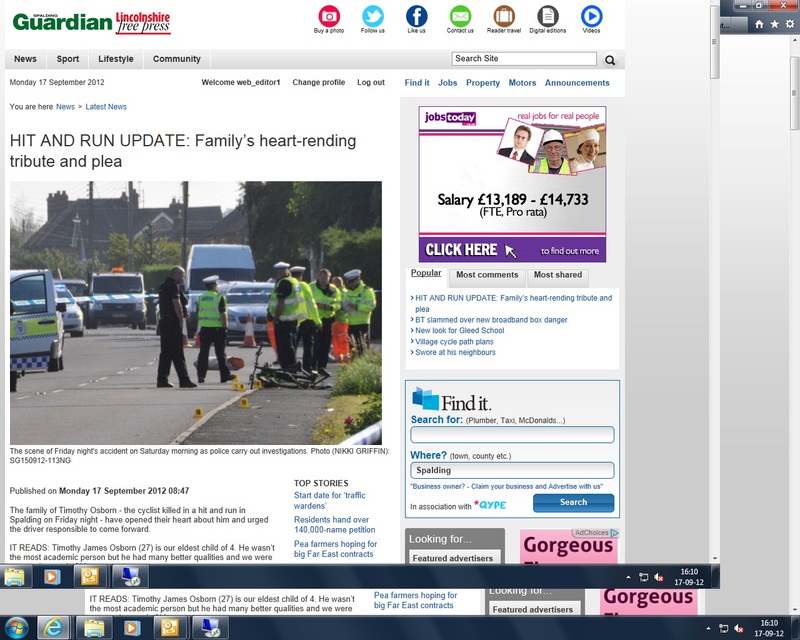 Nikki contacted deputy editor Nigel Chapman and her picture of the scene was uploaded to the website. Editor Jeremy Ransome took over updating the incident throughout the afternoon before the story was updated again following Mr Osborn’s dramatic appeal. “We feel it shows both the importance of information and tip-offs which photographers can get and the way a website and social media can garner very useful information extremely quickly,” he said. A man has since been arrested in connection with the incident. The arrest, which came shortly after yesterday’s 3pm print deadline, meant the newspaper had to reprint 15,000 copies of its front page for today’s edition. Nothing here about whether the newspaper followed up with the dad as regards a full interview/pics – just a description of the newspaper doing its job by getting pictures back to the office quickly for the web and how the website was updated during the afternoon (I would expect nothing less). Yes, can confirm pics and interviews with dad and mum in today’s print edition and online, which also carries a video of the family paying tribute to Tim. However, it’s not that that we feel is out of the ordinary but the dad using our website to reveal his son’s identity less than 24 hours after the incident. Thanks for clearing that up and glad to hear it – the story is certainly worthy of reporting by HTFP, it just lacked the obvious detail of what happened after the dad got in touch. A very good example of how important online is these days in overall communication (between readers and paper in both directions) and, ultimately, making for a quick turn around of a fully developed story for print.